I got this cardigan a couple of months ago, and mostly picked it up because it was on sale - I was a little skeptical about such a bold pattern. However, I'm now so glad I did, as it's quickly become one of my favourite pieces - this outfit, with it over a dress, is still one of my favourites. 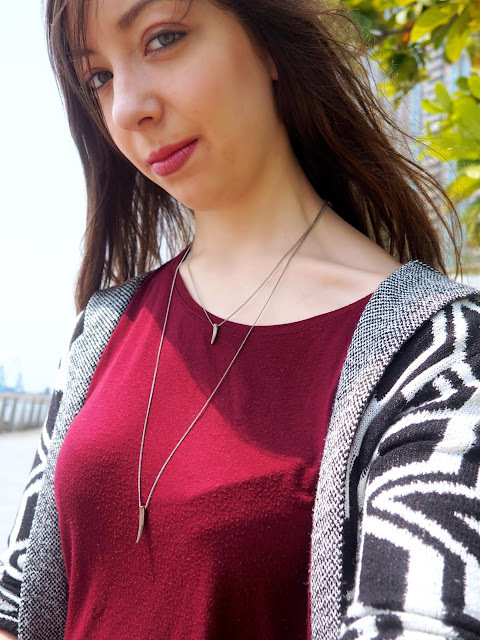 I have a lot of plain cardigans that are easy to throw on top of any outfit, so it's nice to have one that's quite different and is a statement sort of piece on its own. I chose to wear it with a plain top underneath though, to balance it out, and wore my ripped jeans since I feel like I haven't worn them much in a while - I could wear jeans to work in Korea, but not ones as casual and torn as these! I haven't been wearing my Converse out and about as much either, since I wear them most days to work, but then I liked matching them to a more interesting outfit than my work clothes for once! This is also a new pair I got at Christmas, as my old blue ones were coming apart at the seams, so I've gone back to a red pair again.